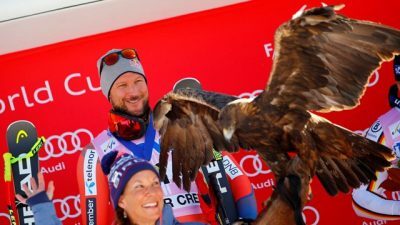 Aksel Lund Svindal, Norway’s top downhill racer in recent years, made himself historic again during the weekend when he all but flew down a mountainside in Colorado to claim his fourth victory at the men’s World Cup downhill race in Beaver Creek. “What a demonstration of power,” exclaimed Norwegian Broadcasting (NRK)’s alpine skiing commentator Marius Arnesen, while the International Ski Federation (FIS) reported that Svindal “stunned” Beaver Creek by setting a record for the course. “Det er deilig (this is very nice),” Svindal himself told NRK right after the race, and after he’d made another brilliant comeback from knee surgery in January that ruined last winter’s season. He’s known for being understated, professional and an all-around nice guy who has fought back from terrible falls and injuries on earlier occasions as well. Newspaper Aftenposten noted how Svindal was smiling from ear-to-ear as he topped the World Cup winner’s podium once again on Saturday, above second-place winner Beat Feuz of Switzerland and third-place winner Thomas Dressen of Germany. Svindal, who all but flew down the course in a minute, 40.46 seconds, was only 15-hundredths of a second ahead of Feuz. That was enough to make him historic once again. He had told NRK right after his run that he wasn’t completely satisfied with it, but after also making a strong comeback at Lake Louise, he’s solidly back on track towards his goal of winning another gold medal at the Winter Olympics in South Korea in February. Svindal, age 34, had said he was “relieved” by last weekend’s third-place win at Lake Louise, because his knee was “functioning” again. And once again he did better in competition that he had on the training runs. Svindal, who comes from the small town of Kjeller outside Oslo (external link to how Svindal describes his background on FIS’ website), also has some back-up plans, though. When he tore his Achilles tendon in an especially annoying pre-season football match in 2014, he realized he needed other legs to stand on. He has invested in various companies including Oslo-based technology firm Norselab, which in turn invests and builds up digital products and other tech firms. It was founded by two of Svindal’s childhood friends, Ståle Løvbukten and Pål Reinert, and Svindal has also been sitting on its board and taking part in decisions. “Maybe this can be my next career,” Svindal told Aftenposten with a laugh back in August, before he headed for training in Chile and into the World Cup season. “I’ve had to find other things to do, too, in areas I’m curious about. I want to be where exciting things happen.” Right now that’s still on the ski slopes as well.